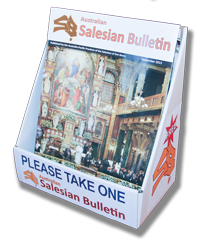 Would you like to have the Australian Salesian Bulletin is distributed in your Parish, School or Center? Tell us how many copies you would like. They’re free. We will deliver bulk orders of 25 copies or more for your community. They come complete with a display box for easy distribution. There are four editions of the Salesian Bulletin each year. With your assistance, we can reach a wider readership and let more people know about the Good News via this quality Catholic publication. If you would like to be added to our list of places where the Australian Salesian Bulletin is distributed from. We will only use for details for the distribution of the Salesian Bulletin, your details will not be shared or used for any other purpose.